Hey there! I hope you all had a wonderful weekend. It sure felt like it flew by! Thanks to all of you who stopped by over the last post. We had so much going on, I really had no time to sit down and reply to all the comments, but my thanks to you just the same! I made one more visit to the chiropractor on Friday, and I feel so much better. but I am committed to getting my health back in order. Today was my first day back at the gym doing a regular workout in about 2 weeks. I finished up these two cottage side tables this weekend, and took them in to the shop yesterday. 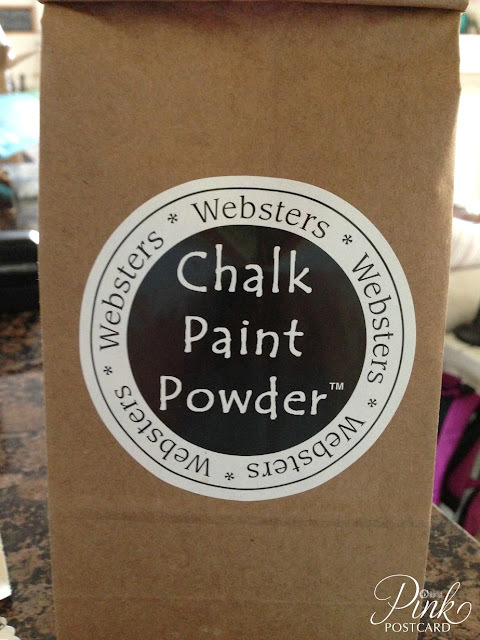 I used a new to me product- Webster's Chalk paint powder. I heard about it through another vendor at Aunt Bee's House, and decided to check it out. I've actually had the powder for awhile now, but I specifically wanted to try out a certain color with my first use. Really simple packaging, and it arrived super fast after I placed my order. Because it is so lightweight, the shipping cost was low. 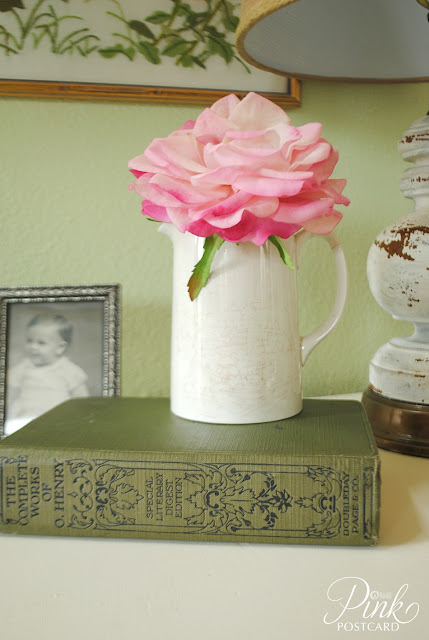 There's lots of information around the web on making your own chalk paint powder, however, most of them use Plaster of Paris. As often as I am painting, I did not want to be inhaling carcinogenic powder every time I mixed paint together. I work with enough chemicals as it is, and I don't want to use something with known cancer causing agents! I have a couple other projects I am using with the color I chose for the side tables, so I purchased a quart of Behr's paint and primer. 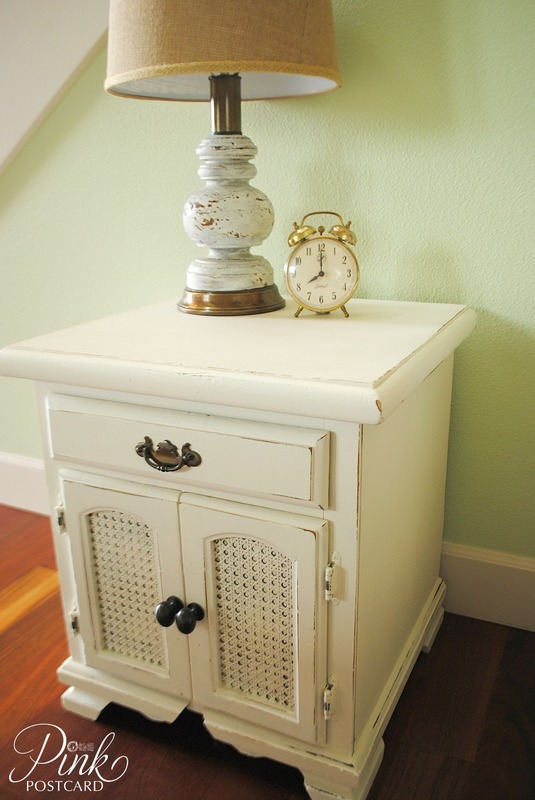 The color is called Cottage White, and I was hoping it would be a good match to Annie Sloan's Old White. I followed the directions for mixing the powder with the paint, but it was overflowing in the can, so I made a quick makeshift paint holder. I know it looks pretty trashy, but it worked great!! 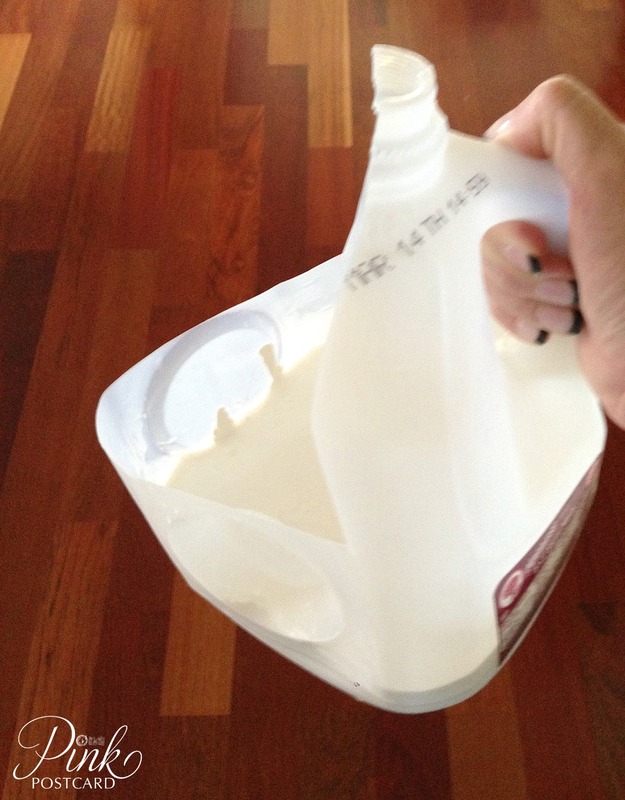 I cut off one side of a milk jug that was in our recycle bin, and dumped all of the quart into my handy container. I was able to continue stirring it, had a handle to hold onto while I painted, and after I used a bit of it, I was able to pour the rest back into the quart can to seal up. The paint worked beautifully, and had all of the qualities I was used to with pre- mixed chalk paint. And I think it's a darn good match to Old White. I have such a hard time finding it!! The last two times I've tried to purchase it, it's been out of stock. Now I can make my own! 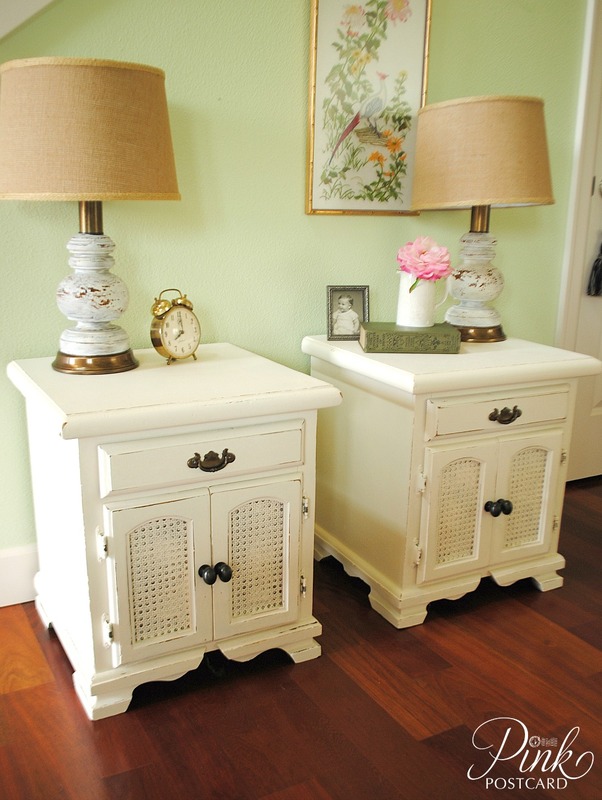 These are really solid pieces of furniture. 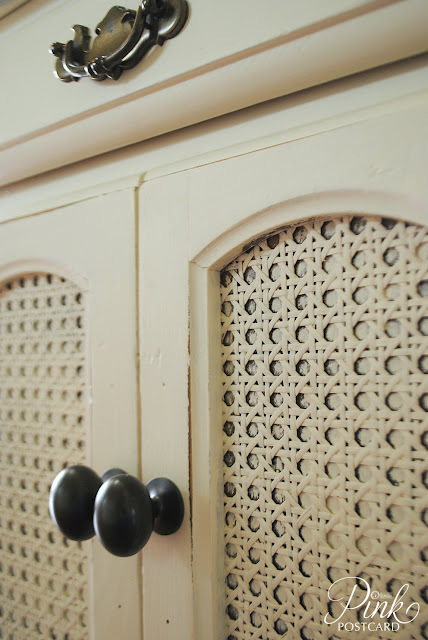 I loved the cane insets on the doors. I could just picture them freshened up with some white paint. I also found a pair of lamps (rare! usually I can only find singles!) with a nice shape and size. I decided to pair them with the tables. These were wood, and pretty rustic looking, but I used some milk paint on them, gave it a chippy finish with some clear and dark wax, and some new burlap shades. I think they are so cute and super versatile. I have another big makeover using Webster's in the same color. (and the same bag. It's lasting quite well!) I hope to have some dry weather soon to finish it up! I am looking forward to mixing my own chalk paint- I think the broad range of colors that I can choose will be a fun prospect. I love using all kinds of paints and products in my work, and sharing the end result. This was not a sponsored post, and I wrote this just because I tried it on my own. They look great! I am taking an Annie Sloan class this week, so I cant wait to try a look like this! I just used the plaster a paris last night, we used a face mask to not breathe in fumes... it was cost effective for the small project we were doing. But when I do my blog post about it, I will mention yours (if that is ok) and the Websters... cause you are right no one wants to be breathing in something that can cause cancer if doing projects on a regular basis. Nice makeover, Denise! They look so fresh in this new color. Wow-Those turned out great. I love the color and it looks great. What a transformation! 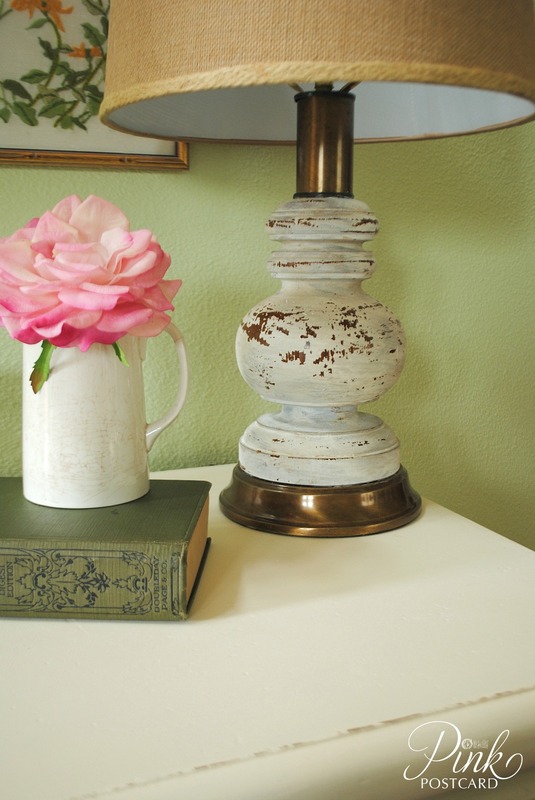 So, what is the base ingredient in the chalk paint powder? Just chalk? 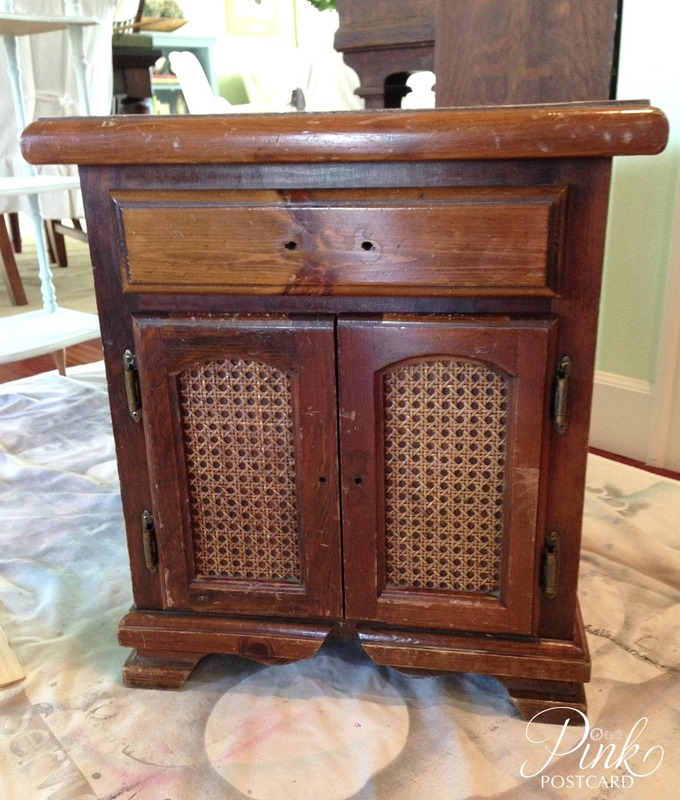 That is an amazing transformation...will have to try out that paint! The tables look GREAT! I have not seen the Webster's - thanks for sharing! Glad to hear your back and feeling better.